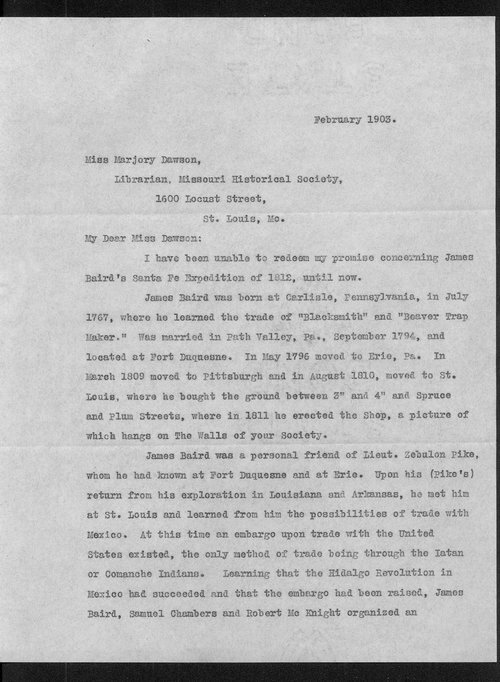 This correspondence between James W. Baird and Marjory Dawson of the Missouri Historical Society, concerns the activities of Baird's grandfather James Baird. The letter from J.W. Baird to Dawson, dated February 1903, provides details of his grandfather's life, including his birth in 1767, his early training, his friendship with explorer Zebulon Pike, and his travels along the Santa Fe Trail which included encounters with Indians. Call Number: Misc., Baird, J.W. Collections - Manuscript - Miscellaneous - Misc. : B-Bak - Baird, J.W.